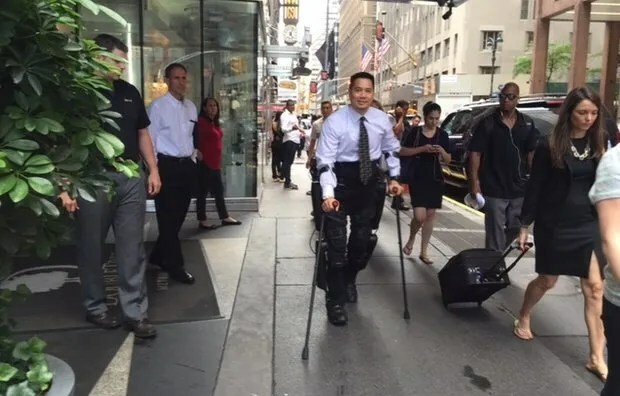 [On July 14th, 2015,] a paralyzed man strapped on a pair of robotic legs and stepped out a hotel door, joining the flow of rushing pedestrians on a sidewalk in midtown Manhattan. The user, Robert Woo, was demonstrating a new exoskeleton unveiled this week, the ReWalk Personal 6.0 from Israel’s ReWalk Robotics. He got a few curious looks as he strode forward in his sleek black gear, but the fast-walking New Yorkers didn’t slow down or clear space for him. ReWalk Robotics’s New Exoskeleton Lets Paraplegic Stroll the Streets of NYC – IEEE Spectrum. This is a nice follow-up on my last weeks post with the seeing cane for the blind.